The U.S. Consumer Product Safety Commission in cooperation with Target Corp., of Minneapolis, Minn. have recalled about 1,500 Circo Children's Space Camp Combo Pack . The floor of the tent failed a flammability test and poses a fire hazard.No injuries reported. The recall involves one model of the Circo Space Combo pack, which includes a children's tent, sleeping bag, backpack and a headlamp. 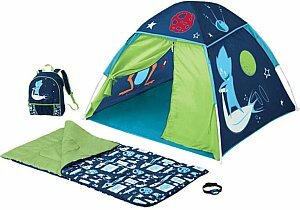 The tent is green and dark blue with planets, stars and figures printed on it. The packing box has the UPC number: 490911500926, DPCI: 091-15-0092. The Circo Children's Space Camp Combo Pack was sold at Target stores nationwide and online at www.target.com from September 2010 through October 2010 for approximately $25. They were manufactured in Bangladesh.